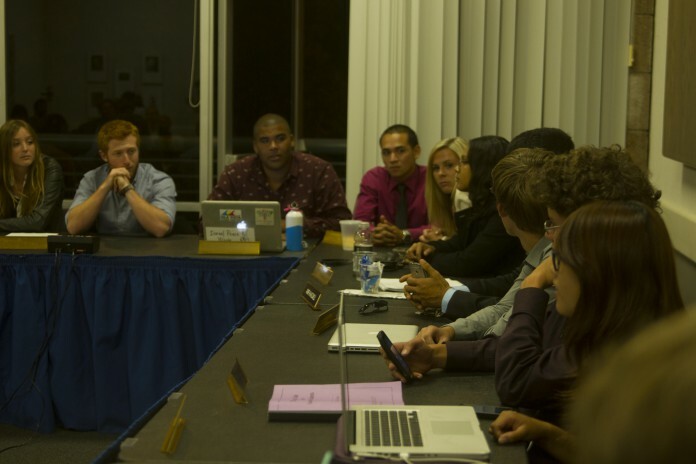 After all the incumbent executive officers and senators were sworn in around midnight on Wednesday, May 22, a new meeting began in which all the new senators began to adjust to their new positions. “You may feel like you’re by yourself but you’re really here together,” said Associated Students Executive Director Marisela Marquez in her first report to the new Senate. Later, all the new Executive Officers—President Jonathan Abboud, Internal Vice President Kyley Scarlet, External Vice President of Local Affairs Alex Moore, External Vice President of Student Affairs Alex Choate, and Student Advocate General Kristian Whittaker—gave the first of their weekly reports to Senate. Some reports, such as Moore’s and Choate’s, focused on projects carried over from the executives in their position. Others discussed things directly pertaining to Senate, such as safe-zone training and things on the agenda for that meeting. Whittaker spoke about the relationships he had formed in AS that led him to be in the place he was. The meeting then went on to discuss appointments the senators needed to approve, such as the chair of Committee on Committees, and the Senate’s first and second pro tempores. However, they ultimately decided to table most appointments to have time to get more knowledge and insight from the people who had made the appointments. They ultimately adjourned their first meeting around 2:30 a.m. on Thursday, May 23.